whose virtues have not been forgotten…. This morning’s first reading come from a chapter that begins Sirach’s listing of the “cloud of witnesses” that enveloped him. As I read her post I recalled my experience last Saturday at the beatification of Monseñor Oscar Romero. 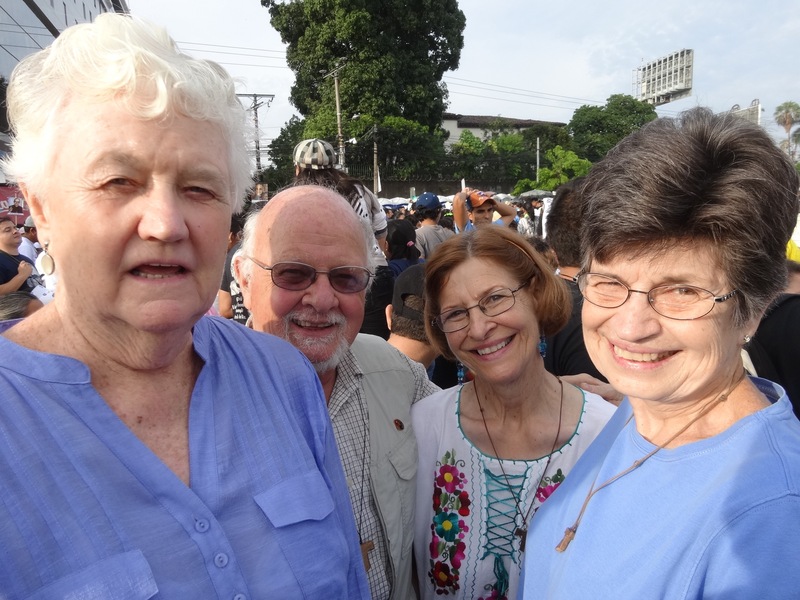 I was standing surrounded by a cloud of witnesses – four women religious. One, a Sister of Charity, has spent more than 28 years in El Salvador; it was a joy to hear Mother Seton mentioned. 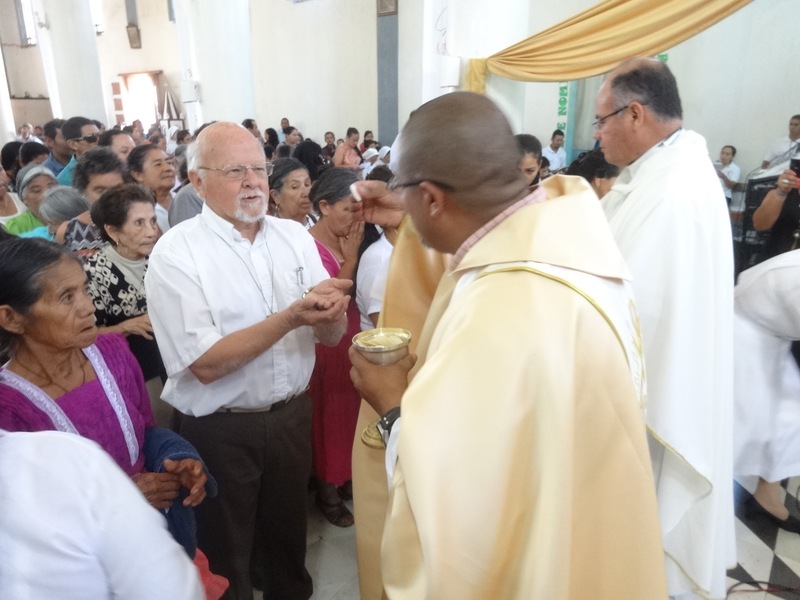 Two others, Dubuque Franciscans, had spent years in Chile and are now in Honduras; it was a treasure to hear the name of the Jesuit Alberto Hurtado; one of them also spent years in El Salvador. An Italian sister with us had also spent years in El Salvador. It was a blessing to feel accompanied by the cloud of witnesses of those who had gone before us as well as by the mist of those who are current witnesses. Saints are for me witnesses of the presence of God in the midst of our broken world. Some are “famous” – beatified and canonized by the Church – or by the sense of the faithful. There are others – the witnesses among us which included those around me that morning in San Salvador. There are even others whom I now remember – two friends who died last week while I was in El Salvador. Mary Sawyer, a colleague at Iowa State University last Wednesday. A friend wrote a beautiful tribute to her that I put on my blog. Father Pat Geary, a gentle man, died on Saturday. He was the priest who hired me to work in ministry at St. Thomas Aquinas Church in Ames, Iowa. I told him several times when I visited the US in the past few years that he was responsible for me being here in Honduras. And so we are surrounded. What is importance is to pass on their memories, to pray to and with them, and to let them and their lives accompany us as we walk the way in the Reign of God. Today is the feast of St. Philip Neri who was a practical joker. Part of that was a defense against those who wanted to adulate him as a saint when he was alive. Part was an expression of the joy he found in God. Perfection does not consists in such outward things as shedding tears and the like, but in true and solid virtues, Tears are not a sign that a man is in the grace of God, neither must we infer that one who weeps when he speaks of holy and devout things necessarily lives a holy life. Cheerfulness strengthens the heart and makes us persevere in a good life; therefore the servant of God ought always to be in good spirits. When a man is freed from a temptation or any other distress, let him take great care to show fitting gratitude to God for the benefit he has received. 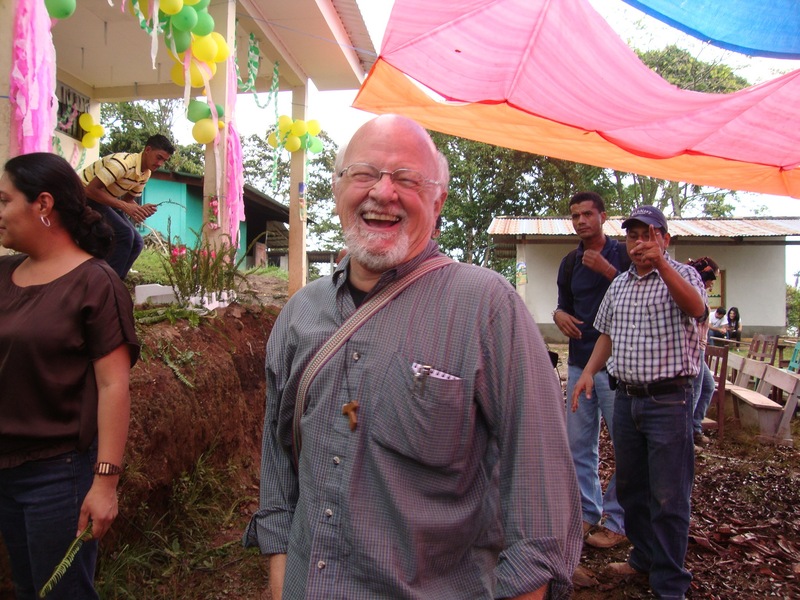 In the last few years here in Honduras I have experienced the grace of joy, of cheerfulness. Also, I have become more “picaro,” mischievous, and more of a “bromista,” a joker. I find myself becoming more like my father whom I remember as a great joker, a man with a great heart. Being able to joke around with people and to be a little mischievous helps break down barriers. It helps us establish bonds. It also can lead us deeper into the love of God, as we set aside our pretensions and rejoice in the good gifts that God gives us. Not everyone has a sense of humor. That calls for an altruistic detachment from oneself and a mysterious sympathy with others which is felt even before they open their mouths. . . . A good laugh is a sign of love; it may be said to give us a glimpse of, or a first lesson in, the love that God bears for every one of us. . . . God laughs, says the Bible. When the last piece of human folly makes the last burst of human laughter ring out crisp and clear in a doomed world, is it too much to imagine that this laugh will resemble that of God . 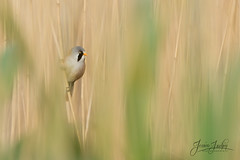 . . and seem to convey that, in spite of everything, all’s well? I have been blessed with a hearty laugh, but I think I saw one of the most amazing manifestations of joy last Friday night, in the midst of torrential rains, as I joined the vigil before the beatification of Monseñor Romero. There were may moments of joy that night, but one stands out. For almost two full hours, between 1:00 and 3:00 am, young Franciscan friars from Central America led a crowd in song and dance – and moments of reflection on the witness of Romero. Their joy was contagious. Here’s a short video which, though it’s shaky in places, gives you a sense of the joy in the Lord that many felt with the beatification of Romero – a sign of the presence of God. If the video doesn’t load on this page, you can find it here. Some might be surprised that the Pentecost sequence invokes the Holy Spirit as Father of the Poor. The Spirit is the Comforter – and comforts the poor in their sorrows and pain. The Spirit is the advocate, the Paraclete – who advocates for the poor in the face of injustice. The Spirit gives the People of God the gift of Courage – so that the poor and their advocates witness to the justice of the Reign of God. The Spirit is the force of Initiative in the lives of God’s people, renewing the Church – so that the Church be truly “a poor Church and a Church for the Poor,” as Pope Francis as said. The Spirit is continually be poured on the People of God, the Church, so that it may live the mission of Jesus, to be Good News for the Poor. Romero who lived the Spirit of Jesus shows us how the Spirit walks on earth. Romero was a comforter of the poor, accompanying those who family members were killed or disappeared. Romero was an advocate for the poor, the voice of the voiceless, speaking out often, especially in his Sunday homilies, to denounce the injustice being done to the poor. 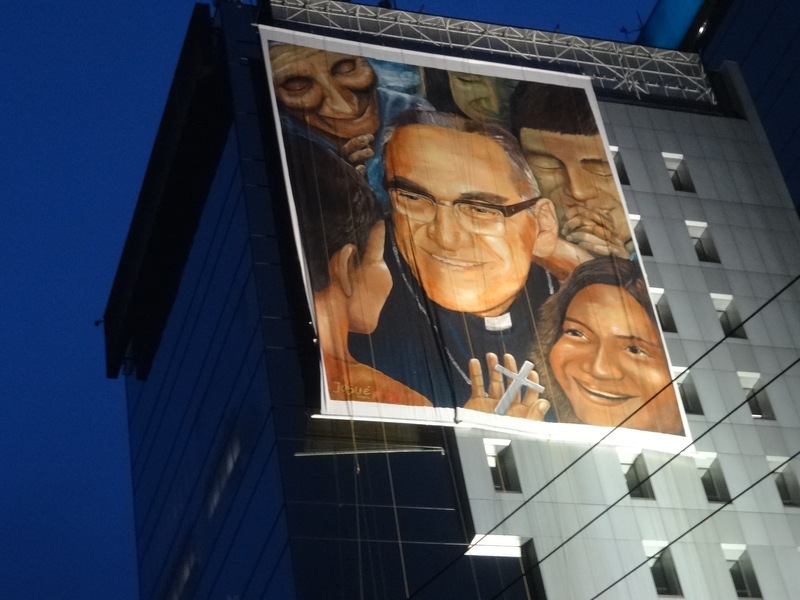 Romero gave people courage by his words and by his presence, as well as by listening to those whom the powers held in contempt – the poor, those struggling for justice. 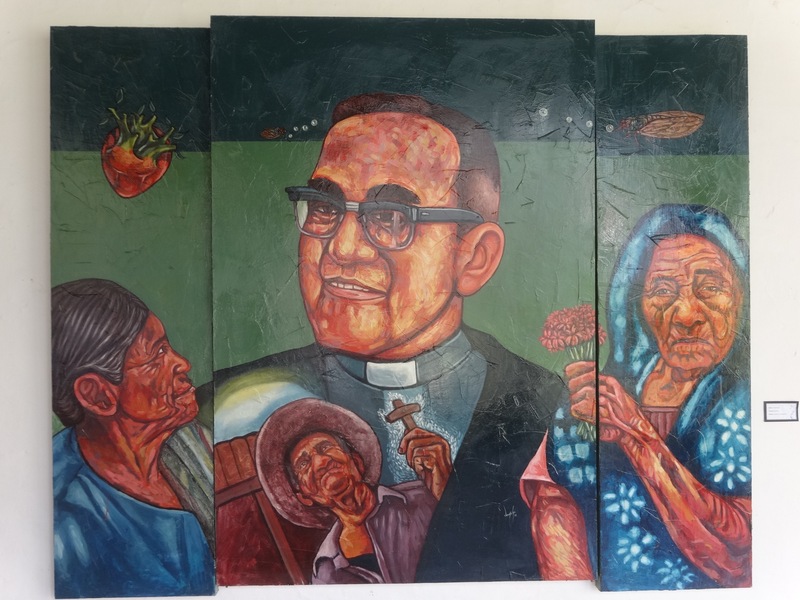 Romero was a force that renewed the Church of El Salvador in his time – and that hopefully will renew the Church today, opening us up to the initiatives of the Reign of God. Romero witnessed to the mission of Christ, especially by his option for the poor and marginalized, in the name of Christ. With Romero, the Spirit of Jesus breathes among us. A friend of mine, Jaime Vidal, in a reply on a Facebook post, reminded me that the Pentecost sequence includes much that shows us how the Spirit breathes among us and how Romero showed us we can let the Spirit blow through us. to the point we let the Spirit into us, we become what He is — pater pauperum [father of the poor], consolator optime [the best comforter], in fletu solatium [solace in the midst of tears]… and we flecte quod est rigidum [bend what is rigid], fove quod est frigidum [fire up what is cold], rege quod est devium [correct what goes off course]… May [Romero’s] glorification on the feast lead many more to open their hearts wide and let that same Spirit in, and become like Oscar, and one with the Spirit. with the blessed martyr Oscar Arnulfo Romero. Honduras is plagued with violent killings. 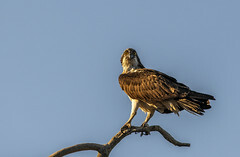 In the big cities these are often related to gangs or to crime. But there are a significant number of killings that are related to vengeance. In our area of Honduras there have been a number of vengeance killings in the last year. Two villages have been deeply affected. At a recent meeting of catechists I heard a story from a few years ago of a feud within a family that started with a dog killing a chicken and ended with deaths of members of the family. So I was surprised to learn of a saint who should be the patron of those who seek to end violence based in vengeance. Last Sunday I was in the village of El Zapote de Dulce Nombre to lead a Celebration of the Word with Communion. They noted that they will celebrate Saint Rita of Cascia, their patron saint, on Friday with a procession, Mass, and baptisms. I have heard of Saint Rita and know that she is revered by many Italians and Italian Americans, but I didn’t know much about her. As I sat listening to the village’s plans, I looked up her short biography in the missal I had with me and was surprised about a few details of her life. 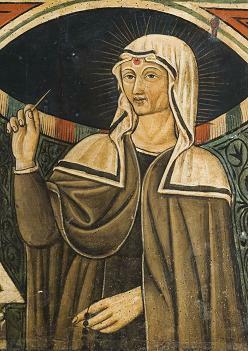 Saint Rita lived between 1381 and 1457. I know that she is often invoked as the saint of impossible cases, but she really should be the patron saint of peacemakers within families. Though she wanted to become a sister, Rita was forced into a marriage with a man who was not very faithful. They had twin sons. After several years of marriage, he was killed by some members of a rival family. His sons wanted to take vengeance on the family of the assassins but their mother forbid it. There is even a story that she prayed to God that it would be better for them to die than to take the lives of others in vengeance. They did die and she decided that now was the time to follow her dream of becoming a sister. She applied to the town’s convent of Augustinians sisters. She was refused because the sisters were afraid that vengeance killings – or at least disharmony – would follow her into the convent, since some of the sisters were members of the rival family that had killed her husband. …inspired by her three patron saints (Augustine, Nicholas of Tolentino and John the Baptist), Rita set out to make peace between the families. She went to her husband’s family and exhorted them to put aside their hostility and stubbornness. They were convinced by her courage and agreed. The rival family, astounded by this overture of peace, also agreed. The two families exchanged a peace embrace and signed a written agreement, putting the vendetta to rest forever. There are other details of Saint Rita’s life which are fascinating but I really think that she needs to be looked upon as an example of how to live the loving reconciliation of Christ and as an intercessor for those places where vengeance and vendettas lead to death. And so today I pray to Saint Rita to help us find ways to stop the cycle of violence that so often plagues us here in Honduras and many other places of the world. Yesterday when I was in line for the procession at Mass in Dulce Nombre, Padre German who was being installed as pastor whispered to me about my being accepted as a candidate for the permanent diaconate at the same Mass. For the Reign of God – in the spirit of Monseñor Romero. This isn’t about me; it’s about the Reign of God. And it’s about doing it as a member of the Servant Church, a Church that is diaconía. The essence of the church lies in its mission of service to the world, in its mission to save the world in its totality, and of saving it in history, here and now. The church exists to act in solidarity with the hopes and joys, the anxieties and sorrows, of men and women [Vatican II, Gaudium et Spes, ¶1]. Like Jesus, the church was sent “to bring good news to the poor, to heal the contrite of heart…and to seek and to save what was lost “ (Luke 4: 18; 19:10). The witness of Monseñor Romero has challenged and sustained me, offering an example of a person committed to God and to the poor. It’s not one or the other – it’s both and more. To be a servant – a diakonos – is be at the beck and call of God and the poor, helping to make clear to all the connection between the table of the Eucharist and the table of the poor. 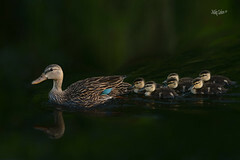 May I have the courage to go forward on this journey – and walk the way of self-emptying to be a servant (Philippians 2). A few days ago Padre German asked me what reading from the New Testament I would like for today’s Mass. He will be installed as pastor of the Dulce Nombre de María parish and I will be accepted as a candidate for the diaconate. It’s a good passage – and a good guide for an examination of conscience for a potential deacon. But I asked Padre German to use another reading. First of all, if that reading were used some might think that was being ordained a deacon at this Mass. That is about a year down the road – God willing. I prefer Philippians 2: 5-11, Paul’s hymn to the self-emptying Christ. For me, the self-emptying of Christ and his becoming a slave are central to my understanding of what it would mean for me to be a deacon. The deacon is, as I see him, the person in the shadows, looking at the needs of others and bringing them to the People of God. The deacon is the one who empties self of all that keeps one self-centered and self-contained. The deacon allows one’s self to be emptied so that God and God’s people might find a place there. During a service trip to New Orleans with one resident and fourteen students parishioners from St. Thomas Aquinas in Ames, we emptied out the house of an African-American grandmother as she stood by. As we emptied out that house, something was emptied out of me so that I could open myself to a new calling – serving God and the People of God, especially the poor, in Honduras. And so today I ask God to give me the grace to be emptied of all that keeps me from being open and available for God and God’s people.